As one of the most prestigious universities in Malaysia, UTM once again accelerates to full throttle in promoting entrepreneurship among its members. Therefore, on 13th August 2018, UTM XCITE in collaboration with the Embassy of the United States of America in Malaysia, has collaborated with Azman Hashim International Business School (AHIBS) in organising the ‘Innovation and Technology Entrepreneurship Forum: An experience from Silicon Valley’. 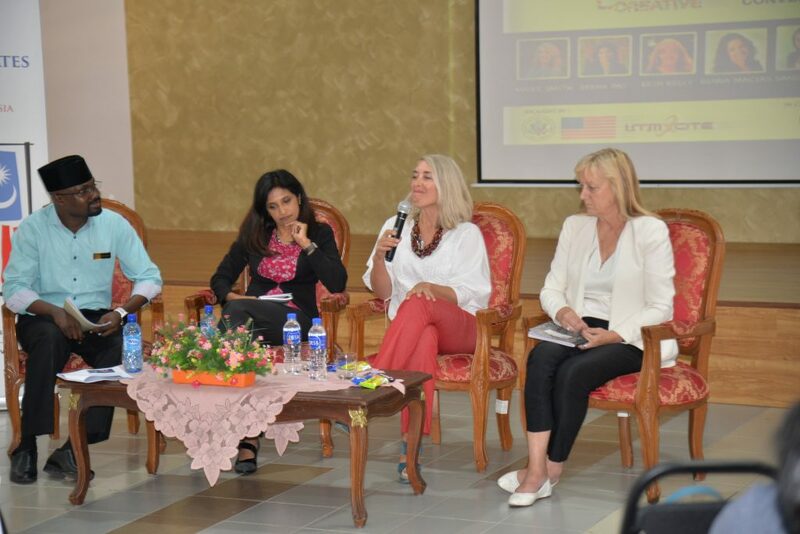 Seven illustrious women technology entrepreneurs from Silicon Valley were specially invited as speakers of the forum. The event which was held at the newly officiated building of AHIBS had attracted a number of audiences from diverse backgrounds including lecturers as well as students. 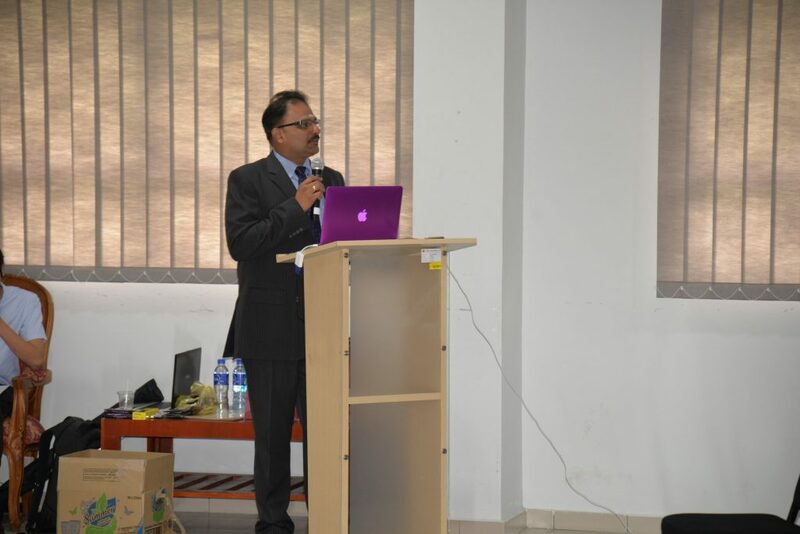 Dr Suresh officiated the event. 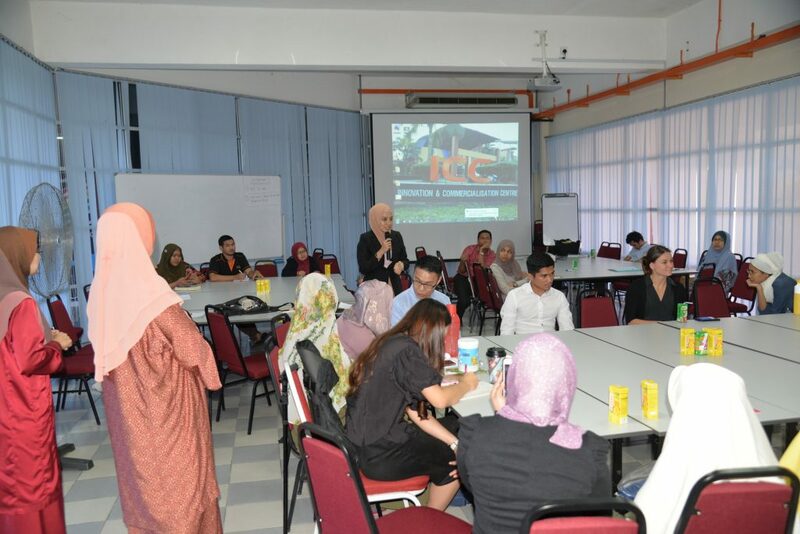 The forum, which was intended to promote technology and social entrepreneurship among the UTM community, was divided into two sessions. The first session delved into the colourful journey as technology entrepreneurs of the invited speakers. The speakers for the first session were Diana Macias (Twitter Inc), Bianca Liederer (Genentech Inc) and Sandra Chen (Facebook Inc). In the second session, the audiences were given the opportunity to listen to three other speakers Rekha Pai Kamath (Fast Forward), Maile Smith (Northgate Enviromental Management) and Erin Keely (Techwomen) discussing on the topic about social entrepreneurship in Silicon Valley from their point of views. At the end of each session, the audiences were allotted times to ask questions. Some of the questions asked by the audiences were about topics ranging from work-and-life balance as career women, to working experiences in big multinational companies in Silicon Valley. First session. From left Dr Aliyu; Diana Macias, Sandra Chen and Dr Bianca Liederer. Second session. 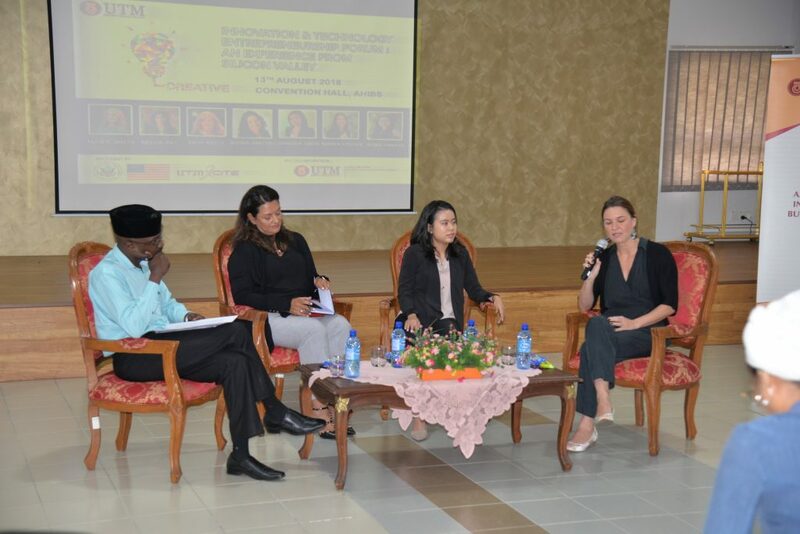 From left; Dr Aliyu, Rekha Pai, Maile Smith and Erin Keely. Both of the sessions were moderated by Dr Aliyu Isah Chikaji. The forum was officiated by Dr Suresh Ramakrishnan, Deputy Dean for Research and Innovation of Azman Hashim International Business School. Tokens of appreciation were presented by Assoc. Prof. Dr Mohd Zaidi Abd Rozan, Director of UTM XCITE accompanied by Dr Ungku Nurul Kamar, Director of Business Admin (AHIBS), to the moderator and invited speakers, marking the end of the forum. Assoc. Prof Dr Mohd Zaidi Abd Rozan accompanied by Assoc. 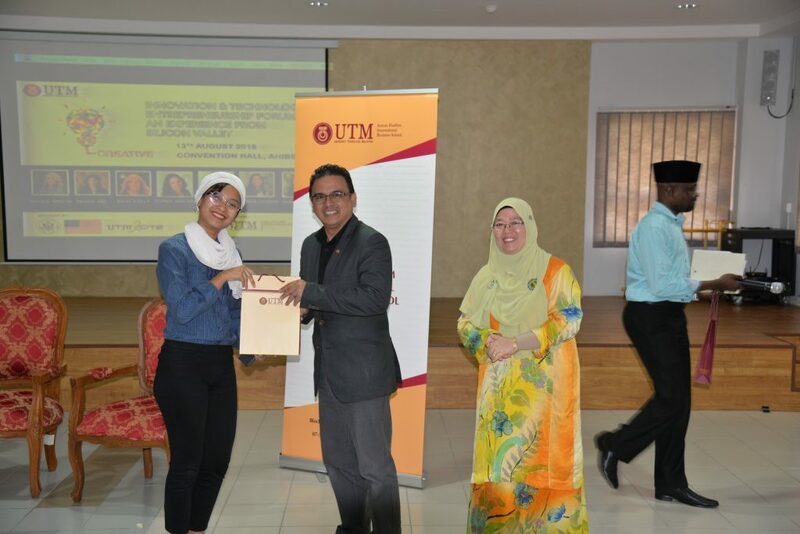 Prof Dr Ungku Norulkamar Ungku Ahmad presented a token of appreciation to Ms. Nur Amalina Che Ariffin, a representative from the embassy. In the afternoon, the guests were invited to a half-day event ‘Science Meets Business’, which was organised by the Innovation and Commercialisation Centre (ICC). Investors, entrepreneurs and researchers as well as lecturers were given opportunities to meet the featured guests, presented their ideas and ventures and to get information and immediate assessment on their products. Sharing session with inventors and entrepreneurs. 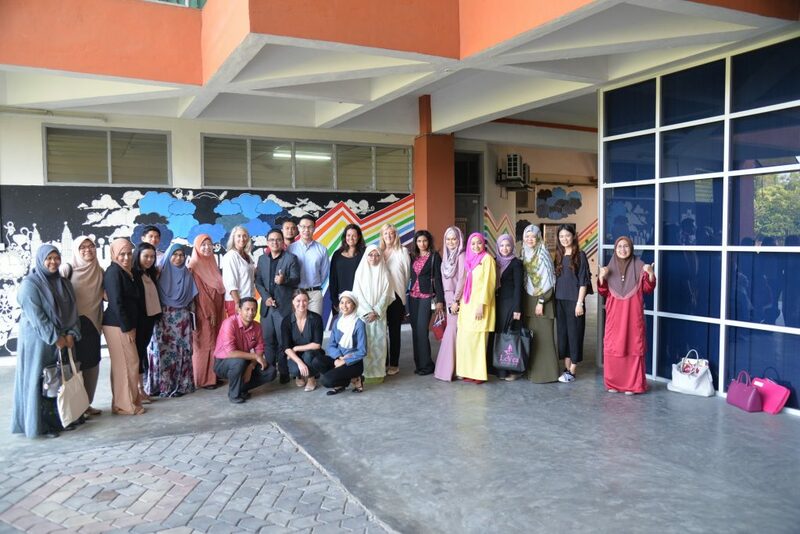 A photo session with the participants. The event also comprised the networking session between the participants and the guests before it ended with a short tour around ICC to showcase some of the products commercialised by ICC. UTM XCITE would like to take this opportunity to thank the Embassy of the United States of America in Malaysia, Azman Hashim International Business School and ICC for their cooperation and support.